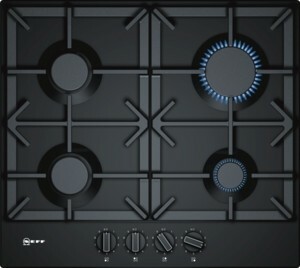 The NEFF T26DS49S0 Gas Hob, in black, has four burners; 1 high speed burner, 2 standard burners and 1 economy burner, for a variety of pots and pans. Ignition is automatic via the front control dials where you can manage the heat of each one. Thanks to the clever control of gas flow, the flame can be precisely adjusted in 9 steps. Always the same reliable and precise power levels for outstanding cooking convenience. Two cast iron supports are strong and sturdy keeping your pans safe. While, the flame failure safety device keeps you safe by cutting off the gas if a flame has been blown out.